As a local search algorithm, FCM is sensitive to the initial value. Randomly initializing the centroids or membership matrix will cause the algorithm to fall into local optimum, thus affecting the accuracy and classification results of FCM. In this paper, a fuzzy-C-Means initial sensitivity optimization algorithm, which based on particle swarm, is proposed for the above problems. In the standard PSO algorithm, the Levi flight formula is introduced to simulate global random walk to enhance particle activities and control the balance of local walking and global random walking in the distance formula by a switching parameter, finally coupled with FCM algorithm. In the experimental stage, this paper conducts clustering test and validity analysis on the accuracy and fitness variety of the algorithm through a suite of UCI standard data sets. The experimental results show that compared with the FCM algorithm and the PSO-FCM algorithm, the PSO-LF-FCM algorithm enhances the clustering accuracy and the global search performance in the later iteration of the algorithm, which implies its superior global convergence and optimal solution search ability. 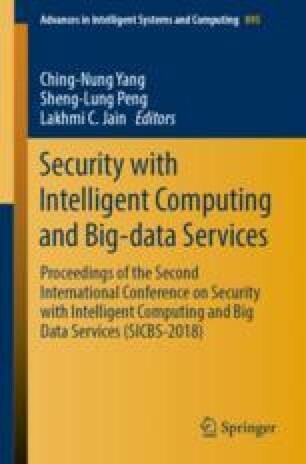 This paper is supported by Data Network Security Assessment Strategy and State Analysis Research Information Communication and Security Technology Project.